For the November PSA meeting program, where attendance is free for members and guests, Tennison gave a presentation of his work and answered questions from a standing-room only audience. The next day, he conducted a sold-out, full-day seminar featuring a live portrait demonstration, a critique session, and a Q&A discussion about the business side of portraiture. Following are some photos from Tennison’s Tuesday presentation and Wednesday portrait demonstration, along with corresponding spectator notes. 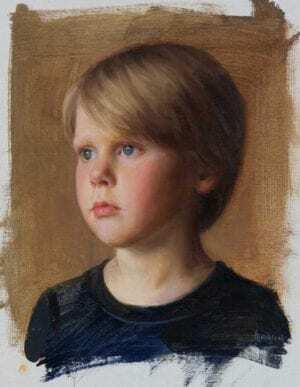 Tennison began his portrait demonstration by blocking in the large shapes with yellow oxide. His usual process is to draw with yellow oxide on an untoned canvas. Moving on, he painted transparent tones between lights and darks. Portrait of Grayson by James Tennison. It’s all about structure. Look three times, think twice, and paint once. Painting in the background will give you something to compare your subject to. When dealing with highlights, try not to overdo. Don’t get “highlight happy,” and make sure your lights are not too light. Tennison is typically not an alla prima painter. When in the studio he will work about three to four hours on a piece, then put it aside for another day. He suggests cleaning your palette often emphasizing that much of the painting process takes place on the palette so you want to keep it clean and fresh. Tennison is renowned for both his works in oil (left), and in watercolor (right). Tennison traveled to Atlanta from his new home on Whidbey Island, Washington. A graduate of the ArtCenter College of Design in California, he started his career as an illustrator. He has taught and guest lectured at several colleges and universities in Texas, and has given many private painting workshops. A versatile artist, Tennison doesn’t limit his work to portraits. His landscapes and figurative work in watercolor and oil are exhibited in prestigious galleries throughout the United States. To explore more of the art of the versatile James Tennison, visit jamestennison.com.